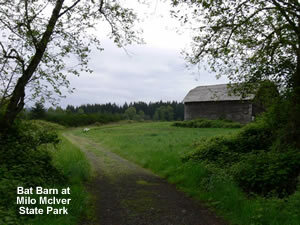 Milo McIver State Park is located in northwestern Oregon just 45 minutes from Portland and a little over 2 hours from the beautiful Oregon coastline. 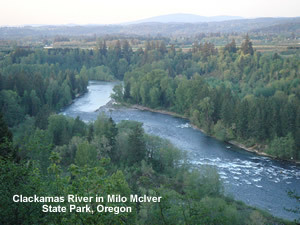 The park is along the scenic Clackamas River where kayak, rafting, and canoing enthusiasts can challenge themselves. If careening through the water is not your thing, there are lots of other things to do in the campground or at the 2 nearby day use areas within the parks 951 acres. The campground has an RV waste dump site, phones, showers, restrooms, handicap accessible campsites and group campsites. The campground is open from mid March to October 30. There are 44 electrical campsites, 9 walk in tent sites, 1 hiker/biker site, and 3 group tent sites. To view a map of the campground, click here. To view a map/brochure of the park, click here. Pets are allowed in the campground but they need to be controlled at all times. When outdoors they need to be on a leash no longer than 6 feet. Reservations can be made from 2 days to 9 months in advance. Reservations can be made online through the Reserve America reservation system or by calling 800.452.5687. There are fees for day use of the park and for camping.